L. Frank Baum’s The Wonderful Wizard of Oz is an intensely visual tale, evoking the wonders of sights unseen except in the strangest imaginings of the oddest dreams. It makes sense to adapt the tale into a visual medium, and the comic has a history of pushing the boundaries of expected sights. Skottie Young and Eric Shanower were able to construct an adaptation that brings through all of Baum’s wonder, and, yes, all of his terror as well. 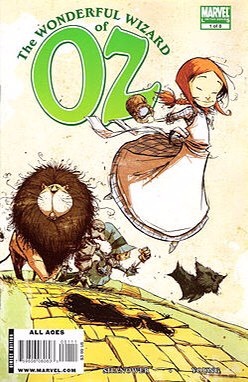 Skottie Young illustrates the comics with a sense of whimsy, creating a Dorothy who wears a dress like a bell, evoking the girl’s role as a person who gets swept up by the winds and dropped off into a strange world. Her dress is mirrored in the clothing of the Witch of the North who similarly resembles a bell flower tossed on the breeze, creating a parallel between these two figures of transformation. Young’s Scarecrow evokes a Tim Burton-esque style with deep circles around his eyes and a twisted, turning mouth. He is a figure that is awkward in movement and his body reflects this with a bulbous middle and twiggish arms and legs. His Tin Woodsman resembles a dwarf given metallic form, strong, stout, and possessing an antiquity in his gaze. His Cowardly Lion is a figure who is completely made up of balls of fur, with small, unthreatening, worried eyes, a completely round face, and sheathed claws. Young’s wicked witches are figures out of horror, contrasting with the bell-shaped figures of the protagonists by being figures of distortion, scribbled together with awkward joints, features hidden by twisted rags, and generally evoking an uncertainty of movement. Their panels tend toward Sepia tones, lending them an antiquity. The magic of Young’s illustrations are the ability to make Dorothy appear to be constantly both part of the imagery of the page and somehow distant from it, evoking her role as an outsider who has come to a new place and yet is able to change it. She is both of the world of the comic and outside of it. Media: Acrylic on canvas, yarn, metal keys, skull beads, glass, plastic halloween decorations, and paper. Bluebeard, the fairy tale most famously written about by Charles Perrault, is a gothic tale of the disempowerment of women and spousal abuse. In the tale, the aristocratic Bluebeard asks to marry one of his neighbour’s children, but all of the girls except for one reacts in horror at the man’s unusual beard colour. The youngest girl agrees to marry him and goes to live with him. Bluebeard gives his new bride a set of keys to every room in the house except for one door. He then leaves the house and his wife is overcome by curiosity and ventures into the room. Inside she discovers that the room is filled with blood and that Bluebeard’s first wives have been murdered and left in the room. She gasps in horror and drops the key. The key becomes stained with blood and when Bluebeard comes home, he finds her with the blood-covered key and attempts to kill her for discovering his secret. She is able to delay him until her brothers can arrive and kill Bluebeard. What has often struck me as confusing about this tale is the horror that is evoked by Bluebeard’s blue beard. It confused me that so much horror could come from a beard that was of a cheery colour. Yet, the whole tale is horrific. My Bluebeard mixed media piece plays with the alternation of cheer and macabre. I chose to highlight the joyous quality that I imagined in Bluebeard’s beard by creating his hair from spirals of yarn. The yarn itself was a variegated blue, allowing for the flow of light blue colours into darker blue. In order to highlight the fantastic nature of his beard, I interspersed beads, glass pebbles, and buttons. These provided some texture that took away from the simplicity of the hair. In order to add a macabre quality to the fantasy of his hair, I included metal skulls to underscore Bluebeard’s murderous qualities. The figure of the key is central to the Bluebeard story, and the key here symbolizes domesticity and, particularly the domestic confinement of women. It denotes the separation of male and female space in the home and, particularly, ideas of privacy and secrecy. In order to accentuate this idea of domestic control and domestic violence, I mix keys and skulls into his beard and hair. His ideas of domestic control are linked to his violence. I use a large key at the bottom of the canvas, bleeding off of the edge, bridging the boundaries between the frame of the canvas and the external world. This is meant to illustrate the key’s power to bridge liminal spaces, between one space and the next. Similarly, the skeletons at the bottom of the painting denote another form of liminal boundary crossing, bleeding off of the canvas to denote the bridging of the space between life and death. The skeletal image is also conveyed in the rib cage subtending the key. This combination brings attention to the idea of the skeleton key, but it also plays with the idea of the cage, the confinement and the idea of the rib cage. The yarn of Bluebeard’s beard constructs a heart-like shape with skeletons interwoven into the heart, illustrating the idea that Bluebeard’s corrupt ideas of love are polluted with violence and decay. Yarn also comes off of the heart to create nooses around the two skeletons, creating a sense of Bluebeard’s love as strangling, choking and linked to the death of his first wives. Body and place are intertwined in this image, interweaving house and body through the repetition of keys. Bluebeard becomes the confining house, tangled with problems and threats. Domestic violence is a terrifying reality of our lives and my hope in depicting the innocent blue colour with the macabre skulls is meant to bring attention to the way that people often do not believe that certain people can be abusers because they “look innocent” or “seem like a nice guy”. This painting is meant to be a reminder that abuse often masks itself as innocence. The keys in this image connect to the original myth, but also denote the idea of the secrecy surrounding domestic assault by the abuser, the people being abused, and the surrounding neighbours who are aware of what is occurring and say nothing. Hansel and Gretel was a tale published by the Brothers Grimm in 1812. Hansel and Gretel is a tale of hunger and candy. It is a tale of the conflict between youth and old age – two children cast out by their family and a witch who wants to consume youth. Derek Stratton uses the body of the witch itself as a framing technique, placing her house and the children within her cloak, affixing the children within the witch’s stomach, which is where her cannibalistic impulse wants to place them. The witch holds a candy dangling from her hand on a line like a fishing line, illustrating the role of her luring the children in. Stratton situates the house itself in the witch’s belly, situating it as a symbolic representation of hunger. The house itself is relatively simple, with few colours. The candy in this case is gingerbread with few drops of colour on the icing. The house has a candy cane beside it and some lollypops in front. By having a very simple house, the focus is not on the candy itself, which often reads as a symbol of greed. Instead, the focus is on the predatory quality of the witch and on the hunger of the children. The house itself is surrounded by idyllic, light greenery, however, this idyllic scene is surrounded by dark woods without leaves which morph into the cloak of the witch. This alternation of light and dark, innocence and corruption is played with in the image with the centre of the image being bright and the edges fading away into the frightening dark of the woods. The macabre quality of this image also situates the children standing above a ground filled with the corpses of other children. They walk toward a teddy bear, evoking innocence, while also underlying the idea that this teddy bear, like the house itself, is a lure, meant to corrupt innocence. Childhood and old age are contrasted in this image with the older woman looking down at the children with hunger, evoking her hunger for youth. The witch’s face is situated at the top of the image, eclipsing everything below and the children are portrayed as innocents, holding hands in her shadow. Ana Juan Gascó’s witch embodies all of the predatory qualities of the spider. Rather than luring children into her home, Gasco illustrates that the witch’s home, like the spider’s, is the web. Webbing hangs down in front of this witch’s body on webbing, holding candy at its tips. Her hat becomes, itself, a form of house with its peaks representing windows. Witch and house are blended together, and the witch’s body becomes the source of the lure for the children. The candy hanging from the witch’s hat varies from ginger bread to bonbons to candy canes. Both children reach toward a single candy cane, evoking a dual image of both competition for treats or, potentially, an older brother helping to bring candy to his sister, for whom the candy is out of reach. The expressions of the children are blank, allowing for multiple interpretations of their intentions and distancing the viewer from the emotions of the children. Our entire focus is directed toward the witch and her surplus of expression, illustrating all of its predatory potential. She looks down with patient hunger, entwining her clawed fingers. The witch’s clothing is one solid cloak of black fabric, bringing the viewer’s attention up to the witch’s face and hands to focus the viewer on her gestures. Rather than emaciated figures, these children are depicted as plump and well-fed, contrasting with the canonical myth of the children as starving and cast out of their home by their parents. Laura Barrett’s illustration of Hansel and Gretel is done entirely in silhouettes, which has the potential to obscure essential features like facial gestures, however, Barrett effectively uses the position of the body to convey emotion and intent. The Witch is portrayed walking with a cane and with her finger cocked in the direction of Hansel with a come with me gesture. The witch’s features are otherwise innocent, with a shawl over her head and a voluminous dress lending a sense of innocence to her. However, her positioning in front of the cage holding Hansel conveys her cruelty. Hansel is depicted sitting casually and without expression in his cage, hanging from a tree. He is contrasted with his sister Gretel on the other side of the house, who is depicted weeping. This conveys gendered assumptions about masculinity and femininity, with the male child depicted stoically while the female figure is portrayed as emotional. Birds are depicted above Hansel’s cage, further reinforcing his captivity by portraying him in the birdcage while birds are portrayed outside of the cage. The entire image is surrounded by thick woods, framing the house as a pretended sanctuary amongst the confusion of the woods. The silhouetted quality of the house allows the reader to project their imagined candy upon the house. The only candy-like features of the house are the drippings at the sides of the house that resemble icing on a gingerbread house. The house conveys innocence with large open windows with light shining through them. Situating the children on either side of the house conveys a sense of separation between them, pulled apart by the house and by the witch, who similarly stands between them. While Hansel looks directly at the witch, Gretel is portrayed looking away from the house, avoiding the horrors within, and yet Gretel is the saviour of the tale, the person who rescues her brother from the witch. Scott Gustafson portrays a Hansel and Gretel with tiny eyes and blushed cheeks mirroring those of Precious Moments statues. Although these figures are chubby rather than emaciated, hungry children, their poverty is illustrated by the ragged condition of their clothing, patched together and frayed. The patches of their clothing brings attention to the mirroring features of the witch, particularly her patches of candy. The stripes of Hansel’s patches mirrors the candy cane striping of the Witch’s dress. Candy is prevalent in this image, so much so that it is beneath the feet of the children and the witch. However, the children still reach for the candy that the witch holds out to them and Gretel’s eyes stare on in wonder at the witch’s armful of candy. There is no house depicted in this image, so the witch again becomes a figure who occupies the space between person and house by having candy attached to her apron and her hat resembling a pastry covered in icing and candy. This witch doesn’t look predatory as others do. She is a figure of innocence with a kind face surrounded by a bonnet. She holds onto a cupcake lightly, as though it is barely in her grasp, already within reach of the children. The connection between the children is illustrated by their entwined hands, but they are simultaneously committed to looking after each other and committed to their hunger. Hansel reaches a hand out to the cupcake held by the witch, while Gretel holds her apron up, presumably filled with candy. Scott Gustafson is an American illustrator who has won the Chelsea Award, an Independent Publisher Book Award, and the 2015 Grand Master Award. Gustafson’s art can be seen at http://www.scottgustafson.com/Gallery_DR_FT_HG5.html where you can also see other views of the witch. Snow White was originally published by the Brothers Grimm in 1812 and has been revisited in retellings and explorations since that time. It’s central features are the magic mirror, the poisoned apple, the glass coffin, and the heart. It is a tale of vanity, ageing, and revenge. Ever since the Disney film Snow White and the Seven Dwarfs (1937), much of the imagery around Snow White has been influenced by the film. Rebenke’s Snow White is dressed in the Disney Snow white colours with a tall white collar and blue, red, and yellow colours, yet each of these colours is shaded, the colours darkened.